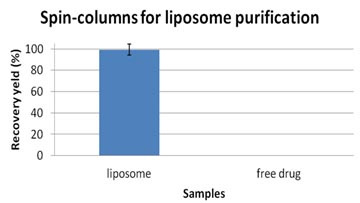 The Spin-columns for Liposome Purification (Catalog number SLP20) is designed for quick removal of free or non-encapsulated drugs. It removes > 99 % of the non-encapsulated drugs in a few minutes. Removal of the non-encapsulated drugs is based on a combination effect of absorbance and size exclusion. When a purified 2 mg/ml liposomal doxorubicin is loaded, 99.3% liposomal doxorubicin is recovered. When a 2 mg/ml free doxorubicin is loaded, 0.2 % free doxorubicin is recovered. The Spin-columns for Liposome Purification (Catalog number SLP20) includes 20 pre-packed spin columns. The columns are pre-packed in water and specifically designed for removal of free drugs in a liposome sample. Removal of the free drug is nearly complete. A minimal amount of liposomes may also bind to the column. For liposomal drug encapsulation and liposomal drug dissolution tests, please use assay kits specifically designed for drug encapsulation assays (Catalog number LDE10) or drug dissolution assays (Catalog number LDD10).